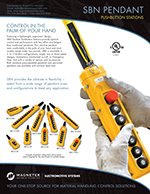 The ideal control for industrial machinery! 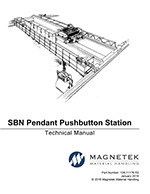 Ergonomic Partners provides SBP2 and SBN crane pendant stations from Electromotive and Magnetek in 2 button, 3 button, 4 button, 5 button, 6 button, 7 button, 8 button, 10 button, and 12 button configurations. The push button control stations are offered in 1, 2 or 3 speed button operations. All of these pendant controllers can be custom configured to meet the demands of any industrial application from vehicle mounted machinery, vehicle booms, overhead cranes, mobile equipment, mobile cranes, vacuum trucks, stacker conveyors, trenchers, grinders, concrete mixers, and more. UL/cUL/CSA Listed. Impact resistant enclosure is double insulated, chemically resistant, rated NEMA 1, 3, 4, 4X and 12. Operating temperature: -10° F to 150° F.
2, 4, 6, 8, 10 or 12 button configurations 1, 2 or 3 speed button operation. 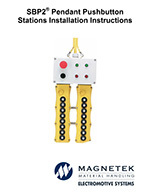 Mechanical interlocks on Single -and Two-speed switches for enhanced safety. Switches are rated 3 Amp, 250 Volt AC. Cumulative contacts on Two- and Three-speed switches provide precise detent feel. Easy-to-read button functions with easily removable button hoods and nameplates. Dual stainless steel hanger rings for external strain relief cable. Polycarbonate pendant enclosure is double insulated, chemically resistant and rated NEMA 4/4x. Operating temperature range: -5° F to 150° F.
Single and Two Speed button pairs feature mechanical interlocks for greater safety. Switches are rated for 3 Amps, 250 Volts AC. External strain relief hardware and an internal cable grip relieve tension on individual conductors and allow the pendant to be serviced while hanging on the pendant cable. Tapered round cable entry gland provides a water tight seal, while a slide-on rubber boot provides added water protection. On 6- to 12-button models, a shrouded knock-out hole is provided for the installation of a pilot light or horn accessory. Switches are designed with visible contacts to ease wiring; a pre-wired common circuit simplifies wiring of switches. Standard units ship from stock, factory pre-wired pendants ship with minimal lead-time. 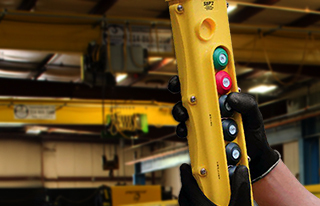 Ergonomic Partners sells Crane Pendants and Crane Push Button Stations serving clients from coast to coast, Canada, Mexico and especially focused in the states of Missouri, Illinois, Indiana, Kansas, Arkansas, Mississippi, Nebraska, Tennessee, Kentucky, Iowa, and Oklahoma.